You love your dog, but it’s okay if you don't love the mess he makes. Next time your furry friend decides to take a nosedive into a muddy puddle, the right shampoo can make your job a little bit easier. Though you may be tempted to lather him up with your favorite human shampoo, these formulas can contain harsh chemicals that irritate canine skin. Instead, pick a shampoo created just for dogs and focus on your pup’s unique needs. From dry and sensitive skin to a little extra scented, we've rounded up the very best ’poos for your pooch. Dogs, like humans, can have allergies that harsh chemicals or additives amplify and make even worse. We love the Pro Pet Works Natural Oatmeal Dog Shampoo because it’s totally free of added colors, sulfates, alcohol, and fragrance. It is a great choice for the sensitive pup in your life. This 17-ounce bottle is a shampoo and conditioner in one. It is made with aloe vera and almond oil, for a totally natural scent that will leave his coat shiny, fresh, and moisturized. 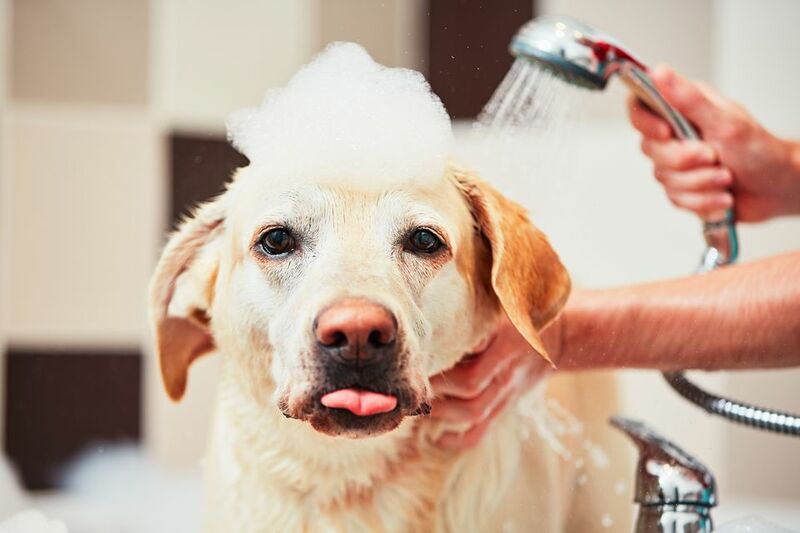 Because it’s soap-free, you can bathe your dog as often as necessary without causing irritation, and any pet parent to a curious dog knows just how important that is. If you own an “ultimate shedder,” you know that it’s a daily battle to keep your home (and your black pants, winter coat. and, well, everything you own) free of pet hair. Tackle the problem at the source with this FURminator deShedding Ultra Premium Dog Shampoo. This 16-ounce shampoo should be used once a month to help reduce shedding and promote a healthy coat. It’s formulated with omega-3 and omega-6 fatty acids, calendula extract, and papaya leaf extract to help release your dog’s undercoat and keep his skin healthy. The FURminator company sells a line of deshedding products and recommends following each shampoo and conditioning with a good brush-down. An itchy dog is an unhappy dog. Radiance Naturals Oatmeal and Aloe Shampoo is like that oatmeal bath your grandma used to give you, but for your pooch. Infused with oatmeal, aloe, coconut, and palm, this 16-ounce shampoo targets your pup’s dry, itchy skin and gives it the nourishment it needs. It’s also alcohol-, detergent-, and tear-free, and made with all-natural ingredients. The company offers a money-back guarantee if for any reason it doesn’t work for you or your four-legged friend. Overall, Radiance Naturals is raved for leaving dogs soft and flake-free after a wash while leaving behind a subtle, fresh scent. Fleas are every pet owner’s biggest fear. Adams Flea and Tick Cleansing Shampoo can make the battle against these pests a little easier. Meant to be used as a complement to your dog’s regular flea and tick preventative, Adams kills flea eggs and stops their life cycle in its tracks. It also works against brown and American dog ticks and lice. The shampoo protects your dog for up to 30 days after every wash, further repelling fleas and ticks. It’s available as either a six- or 10-ounce bottle and is safe for puppies. A tip: To effectively use Adams Flea and Tick, you will need to apply it and allow it to soak for five minutes. Wahl Puppy Shampoo is like a big, warm hug for your young pup. Its gentle formula is infused with cornflower and aloe. Great for all types of skin, the formula is totally tear-free as well, so it won’t irritate your growing (and probably splashing) puppy. As a bonus, this shampoo neutralizes odors and is alcohol- and paraben-free, and is pH balanced just for your pup. Each bottle contains 24 ounces of product. It’s okay to love your dog and still wish he smelled less like a dog all the same. Fresh 'n Clean Scented Shampoo is made with smelly dogs in mind and leaves behind a clean and appealing scent. It’s infused with wheat protein, aloe vera, and vitamin E to protect and strengthen Fido’s coat and skin. It also works to remove tangles and mats to make brushing a little easier. The 18-ounce bottle lathers up well and a little goes a long way with this strongly scented shampoo. Pet owners say that unlike other dog shampoos, Fresh 'n Clean lasts for up to two weeks after a wash. No matter how smelly your pup is, this one works so well it may even earn him a spot in your bed. Whether your dog is a senior and struggles to get in and out of a tub or he’s just deathly scared of the idea of water, Miracle Coat Dog Shampoo is a great alternative to standard shampoos. This spray-on shampoo freshens your dog’s coat without the use of water: Simply spray on your dog’s coat, lather up, and towel dry. It not only cleans but also nourishes dry skin and leaves behind a “meadow-fresh” scent. You can purchase it in either 12-ounce or 32-ounce bottles. The smaller option is a great choice to store in your car for all those messy dog park days.